Abstract: Research methods from human-computer interaction have become increasingly adopted in music technology and other creative disciplines like audiovisual performance. This talk presents several projects from the EAVI group at Goldsmiths that look at embodied interaction for gestural music and a/v performance, haptic interfaces, and immersive media. In particular, we draw upon trends in Third Wave HCI as ways to look connect artistic research to scientific method, to accommodate qualitative measures of experience while avoiding strictly personal subjectivities. These methods, grouped under the broad rubric of User-Centred Design include ethnographic observation, critical incident technique, structured brainstorming, storyboarding, and various types of sketching exercise. I present a family of projects that used this family of methods, resulting in muscle-based musical instruments, A/V software, accessibility devices, and surround projection spaces. 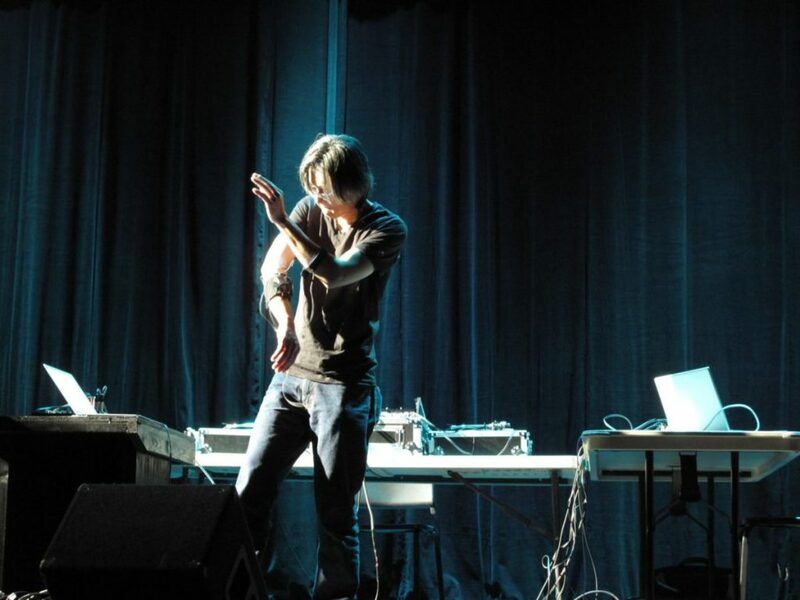 Bio: Atau Tanaka (UK/US) bridges the fields of experimental music, media art, and scientific research in embodied human-computer interaction. He is widely known for his pioneering works for sensor-based instruments and bio-signals, mobile infrastructures, and democratized digital forms. His first inspirations came upon meeting John Cage during his Norton Lectures at Harvard. Atau then studied at CCRMA Stanford, and conducted research in Paris at IRCAM, Centre Pompidou. He formed Sensorband with Zbigniew Karkowski and Edwin van der Heide and then worked in Japan, performing with Merzbow, Otomo, and KK Null. He re-staged Cage’s Variations VII with Matt Wand and :zoviet*france:. His work has been presented at NTT/ICC Tokyo, Ars Electronica, ZKM, Transmediale, Eyebeam, Wood Street Gallery, SFMOMA, and the Southbank Centre, and has had CD releases on labels such as Sub Rosa, Bip-hop, Caipirinha Music, Touch/Ash, Sonoris, Sirr-records. He has been researcher at Sony Computer Science Laboratory Paris and Artistic Co-Director of STEIM. He is Professor of Media Computing at Goldsmiths, University of London. Marcin Pietruszewski – Integrating Xenakian ‘sieve’ with the new pulsar generator. Sara Lenzi – Experiencing Data. The Added Value of Sound in Making Sense of Complex Phenomena. The work spans out from my ongoing artistic research practice focused on reinterpretation and dramatisation of a historical sound synthesis technique called pulsar synthesis [Roads and de Campo] . Featuring novel digital instrument design and machine listening techniques seamlessly integrated with a sieve algorithm as first introduced by Iannis Xenakis, the work probes the material, symbolic and conceptual aspects of the synthetic medium. Daniel Ross – King Canute: Eat Your Heart Out! This piece is an electroacoustic performance controlled by the Myo, a muscle-sensing device worn on the arm. The piece uses sonification of the body and gestural-controlled audio sample manipulations to create a contemporary answer to King Canute’s attempts at turning back the tide. Its original performance was scheduled at high tide on the beach as part of the Whitstable Biennial 2018. The sea had definitely changed direction by the end of my performance. King Canute, eat your heart out! Three short pieces that look at different ways in which forearm muscle tension can be used to sculpt sound. A sensor system detects the electromyogram (EMG) signal, electrical impulses from the nervous system causing muscle tension, and renders a musical instrument the performer’s own body, allowing him to articulate sound through concentrated gesture. Le Loup: A single short recorded sample of howling wolves are stretched and transposed, creating a continuous growling. Lifting : Whistling oscillators are modulated in frequency and amplitude, recalling the classical Theremin. Myogram: A direct sonification of muscle activity where we hear the neuron impulses of muscle exertion as data. Throughout the piece, the raw data is first heard, then filtered, then excite resonators and filters. This piece was created in collaboration with Miguel Ortiz.